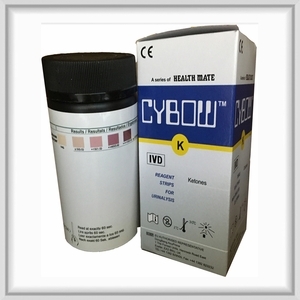 Ketone Strips provide a fast, convenient way of testing urine for the presence and concentration of acetoacetic acid (ketone). This substance, when found in the urine, provides information on carbohydrate and fat metabolism. Compare the color change of reagent pads to the corresponding color chart on the bottle label. Read results according to the chart's time frame for each panel tested. Read results in minutes. Each container of Ketone reagent strips has a color coded chart. The reactive color of each panel on the test strip is compared to the closest corresponding color on the result chart. As with all tests dealing with color intensity or color matching, it is often recommended to obtain another person's interpretation of the test result.